I love soup, and I love being able to make a big pot of it to get me through the week. A recipe on the Epicurious web site for broccoli rabe soup in a garlic broth most recently caught my attention so I decided to give it a try. 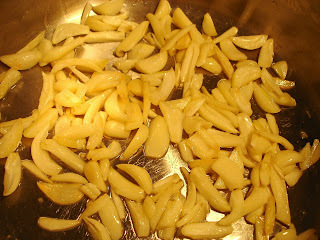 I started out by following the original recipes, but the one for garlic broth just wasn't working so I made it my own. 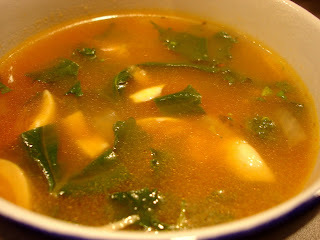 Here are the links to the original recipes: Garlic Broth, Broccoli Rabe Soup. Below are directions for what I did. Note - you'll need 3 heads of garlic. Yes, heads, not just cloves. Peeling and slicing the garlic is time consuming, but so worth it. Look at all this garlic! I LOVED this soup. 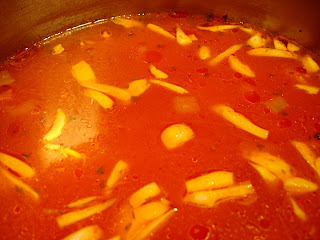 It was extremely flavorful and soothing - great if you have a cold or are just trying to keep warm in the cold weather. I was surprised that the garlic wasn't too strong. Instead it was soft and sweet and just delicious. I cannot imagine how bland this soup would have been if I followed the original recipe. The changes I made were perfect. I will definitely make this again! Next time I either won't use pasta or I'll cook it separately. When I got the soup out for lunch today, the pasta had soaked up a lot of the broth. I'd rather add the pasta to each bowl to avoid this. I found your blog via the nest. I'm another food blogger! We should swap links.